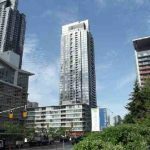 Beautiful 1 Bedroom With Stunning Sunny West Lake Views. Very Functional Layout With Great Storage. Across From Sobeys & Banks. Steps To Financial District, Rogers Centre, Cn Tower, Trendy King St West & Entertainment District. Perfect For The Young Professional. Amenities Include: Indoor Pool, Exercise Rm, 24Hr Concierge & More. This entry was posted in Axon by AxonCapital. Bookmark the permalink.